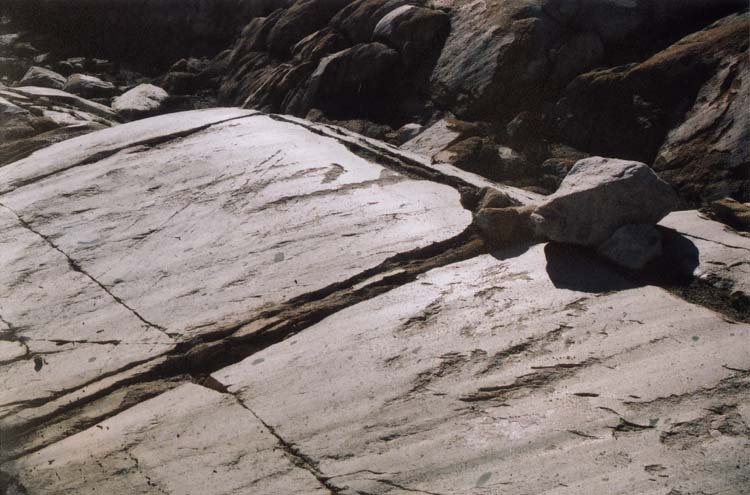 Some really nice striae (grooves) on a slab of slanted granite bedrock that were carved by the passage of rocks within the Columbine Glacier. Also note the reflectiveness of the top of the rock: that is glacial polish. The joints (cracks) in the rock happen to run parallel and perpendicular to the slope of the surface. That is no accident as the glacier erodes via both block removal (where the joints would come into play) and wearing away (which produces the striae and polish).